We had some great food (and drinks!) in both Panama and Costa Rica when we travelled there earlier this year, but the most memorable food we had was a fish taco from a street-food-style grill in Boquete (pronounced Bock-et-ay). Boquete is a small town located in the highlands of the province of Chiriqui, Panama. It’s only about 40 minutes by car from David, the second city of Panama. Because of its elevation (about 1200m above sea level), the climate is quite a bit cooler than the climate in the lowlands of Panama. Basically, it’s spring all year round. This draws the attention of many expats, particularly retirees, bringing a chilled-out and friendly vibe to the place. The Rio Caldera flows through the town and adds a relaxing ambience to the bundle. As Chiriqui is known for offering adventurous activities such as white water rafting, Boquete is also a hub for backpackers and globetrotters. Bringing this interesting mix of people together has had a positive effect on the diversity of local bars and restaurants and we found that Boquete caters very well for tourists without being crowded or feeling overly touristic. In one of the many restaurants around the town, we found one of the best meals of our trip. Now, this leads to the famous fish tacos from Big Daddy’s Grill. No matter where we asked the locals where they recommend to eat, Big Daddy’s Grill and their fish tacos always got a mention. Because of that we were determined to try these mythical tacos and visited this place with high expectations. Fish tacos are thought to have originated in Baja, Mexico, where a large immigrant population of Japanese fishermen lived. They deep fried the fish they caught and wrapped it in tortillas along with some other ingredients, like shredded cabbage. Thus the fish taco was born. So we took ourselves off to Big Daddy’s Grill one evening and ordered up the goods. The service was very friendly and the beer was very cold. But the true highlights were the most awesome fish tacos I ever had in my life (ok, it was also the first time I ever had tried fish tacos). I immediately fell in love with the mix of fresh and tasty flavours. We loved it so much that we decided to try and recreate the authentic fish taco experience ourselves at home. Now I’m not going to say that you can’t make nice fish tacos here in land-locked Switzerland, but you definitely don’t get fish as fresh as in Panama, where you’d struggle to find somewhere more than 100km from the ocean. 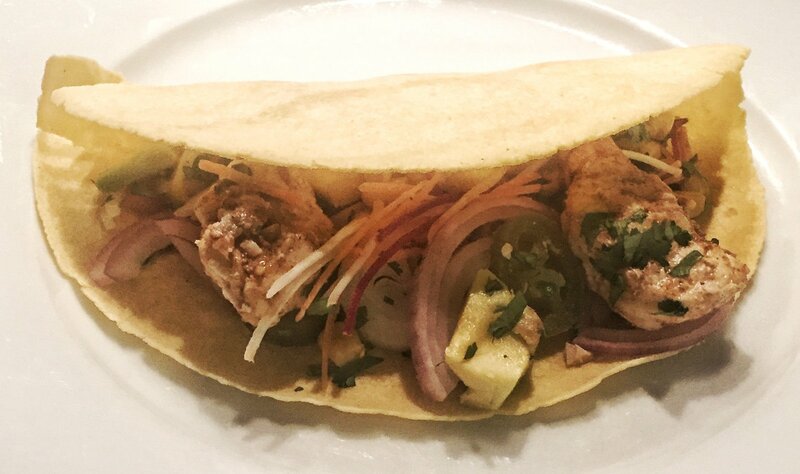 As we had already decided that going on with a life without fish tacos in it was not an option, we created our own fish taco recipe. I think we use this recipe at least once a month because you can’t ever get enough of fish taco (as you can already tell by the number of times that I wrote fish taco). Are you interested in discovering other street food than Tacos? Before I share my take on this yummy dish, I would like to give a big shout out to Big Daddy’s Grill. If you’re interested to learn more about this awesome Grill, visit it on Facebook. But for now get ready for our fish taco recipe TripGourmets-style. Wash the fish fillet, pat it dry, cut it into bite-sized pieces and place it into a dish. Pour over the juice of one lime. Peel the garlic, finely chop it and add it to the fish. Add a pinch of chilli powder and the ground cumin and mix it all together. Cover it and put in in the fridge for 15 minutes. Wash the crunchy salad and cut it into small pieces. Peel and slice the onion. Wash the coriander, shake it dry and finely chop the leaves. Slice the avocado into two halves and remove the stone. Slice the flesh into small pieces while the avocado is still in its skin and then divide the flesh from its skin. Add it to the mix. Put the sweetcorn also into the mix and drizzle over the juice of half a lime. Add in 1 tsp of avocado oil, and the seasoning and mix everything together. To make the salsa, mix the mango, the bell pepper, the chillis and the onion in a serving bowl. Pour over the lime juice and mix it well. Season to taste with salt and pepper and let the salsa rest for at least 10 minutes. Prepare the tortillas according to the instructions on the package. Fry the fish in a little oil at middle heat for about 5 minutes. Here you need to be very careful that the fish pieces don’t crumble, turning them gently. Season the salad-avocado mix once more to taste after you fried the fish and spread it on the warm tortillas. Add the fish on the top of it. Pour over 1 to 2 tablespoons of the salsa and some pieces of jalapeno. At last, fold the tortillas once, make sure you have plenty of napkins (or a change of clothes!) available and enjoy! Click here if you are shopping from outside of the US.